I’ve been waiting for this book from the library for quite a while, and I’m happy to say it’s magnificent (from Latin, magnificare, “to magnify”). Lately, I’ve been trying to learn Latin, which involves chores like repeating, ad infinitum, the ablative ending in the imperfect tense, but also treats, like deciphering snippets of Julius Caesar’s account of the Gauls. SPQR reminds me why I bother, and why Rome matters, even for people who would never get within a mile of a Latin grammar. But if you venture here–and I heartily recommend that you do–be prepared to abandon preconceived ideas. “Rome,” as Beard declares early on, “was not simply the thuggish younger sibling of classical Greece,” devoted to engineering, war, and moral absolutes, whereas the Greeks favored intellectual inquiry, theater, and democracy. Morever, she notes, praise for Greece at Roman expense began with the Romans themselves; throughout SPQR, she quotes skeptics who criticized laws, common behavior, military misadventures, garish buildings, or corruption. So much for absolutes. 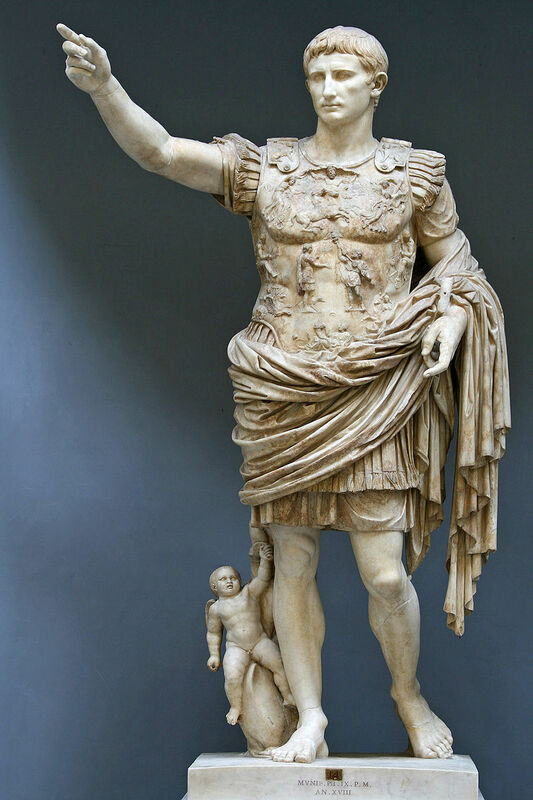 The so-called Prima Porta statue of the Emperor Augustus, 1st century CE, now in the Vatican. Note the martial attire and the baby, probably an image of Romulus, the city’s legendary founder (Courtesy Wikimedia Commons). Senators were essential to the running of the empire. Among their number were most of the emperor’s friends, advisors, confidants, dinner guests and drinking partners–as well as the men who, second only to his own family, were likely to become his successful rivals, vociferous opponents and assassins. She also corrects or casts doubt on many stories handed down over generations. Apparently, the dying Julius Caesar did not say, “Et tu, Brute,” as Shakespeare has it, but admonished Brutus in Greek, perhaps calling him a child. (The meaning is ambiguous.) Nor was Brutus “the noblest Roman of them all,” having left a trail of murder and extortion as governor of Cyprus. Was the Emperor Claudius the just, forward-thinking, moderate ruler Robert Graves portrays in his marvelous novels? Not if you include the executions of thirty-odd senators and a dice habit for which Claudius had his carriage rebuilt so he could play while on the move. Did Nero really make his horse a senator? Probably not. A more nuanced portrait emerges in these pages. Despite xenophobia, which could be extreme, Rome expanded the definition of citizenship well beyond the Greek model to include not only residents of lands far outside the city but, by 212 CE, thirty million others living in provinces throughout the empire. Like all ancient cultures, the Romans took slaves, but they also freed many, an unusual policy that drew admiring commentary from contemporaries, an explanation of how the Romans insured political loyalty in their vast empire. Under the republic, a system of checks and balances among the senate, the consuls who had monarchical powers, and the common folk assured that no one force would always have the upper hand–at least, according to Polybius, the astute Greek historian who lived in Rome. Once an adult woman’s father died, she could own property, buy or sell, inherit, make a will, or free slaves, legal rights that compare favorably with those of any Englishwoman before 1870. But Beard insists that Roman accomplishments or failures aren’t what make its history worth knowing and discussing. Their legacy, she says, goes far beyond political structures, art, famous public works, literature, or philosophical ideas. It’s that they talked about the same issues we do, so much so that the questions they asked sound as if they were taken from today’s headlines. Beard has convinced me. To consider Roman history means to reflect on our own problems.